Two things you can be sure of when you embark on reading ‘A Weird West’ novel from Mike Resnick, you will be highly entertained and the unexpected will happen. In the alternative realities that are generally known as Steampunk, the vision is of a Victorian style world where steam power has been linked with all the technological advancements that current society uses electronics for. The turning point or historical divergence appears to be the understanding of the potential of electricity. Some adventurous scientists saw the potential of this force. One of them was Thomas Edison. Readers of Resnick’s earlier novels set in the Weird West will be aware that in his alternative America, the power of the native American medicine men stopped the advance of the continent’s colonisation at the Mississippi. There were townships across the boundary but mostly they were lawless. In one town, Tombstone, site of the O.K. Corral, Edison and Ned Buntline have set up home and electrified the place, proving streetlights, electric stage coaches and whores. It was there they met Doc Holliday. As ‘The Doctor And The Dinosaurs’ opens, the year is 1885 and Doc Holiday is on the verge of dying of consumption when Geronimo turns up at his bedside. The most powerful medicine man in the west is worried. There are two palaeontologists, Edward Drinker Cope and Othniel Charles Marsh, who are unearthing dinosaur bones in a Comanche sacred burial ground. If they continue, the Comanche have declared that they will resurrect the beasts. If that happens, all humans will become the prey of the carnivorous monsters. Geronimo wants Doc to stop them. After all, as he managed to persuade the railroad to change course, a couple of men digging up old bones should be no problem. Except these are stubborn men whose intense rivalry will not allow them to give up. Geronimo’s bargain with Doc is to give him another year of live. 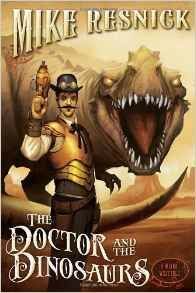 Doc teams up again with Theodore Roosevelt for this adventure and, since they regard the Comanche’s threat as real, they invite Edison and Buntline to join them with an invention to take down a dinosaur, a challenge that the two scientists relish. Many of the characters in these books (this is the fourth in the series) are historical figures. Cope and March were indeed bitter rivals trying to outdo each other in finding and naming new prehistoric species but this alternative reality allows Resnick to play with them in ways that purist historians would not have countenanced. Also expect to find other well-known personalities from the Wild West such as Bill Cody and Cole Younger. These are playful books. They are also beautifully produced with a beautiful cover and interior illustrations by Andrew Bosley. They are an indulgence but one well worth participating in.